Hc Verma i Solutions for Class 11 Science Physics Chapter 7 Circular Motion are provided here with simple step-by-step explanations. These solutions for Circular Motion are extremely popular among class 11 Science students for Physics Circular Motion Solutions come handy for quickly completing your homework and preparing for exams. All questions and answers from the Hc Verma i Book of class 11 Science Physics Chapter 7 are provided here for you for free. You will also love the ad-free experience on Meritnation’s Hc Verma i Solutions. All Hc Verma i Solutions for class 11 Science Physics are prepared by experts and are 100% accurate. You are driving a motorcycle on a horizontal road. It is moving with a uniform velocity. Is it possible to accelerate the motorcycle without putting higher petrol input rate into the engine? Yes, it is possible to accelerate the motorcycle without putting higher petrol input rate into the engine by driving the motorcycle on a circular track. Time period (T) is same for both the cars. A car moves at a constant speed on a road as shown in figure. The normal force by the road on the car NA and NB when it is at the points A and B respectively. From the figure in the question, it is clear that rB>rA. Here, normal reaction is inversely proportional to the centrifugal force acting on the car, while taking turn on the curve track. Also, centrifugal force is inversely proportional to the radius of the circular track. The centrifugal force is a pseudo force and can only be observed from the frame of reference, which is non-inertial w.r.t. the particle. The centrifugal force on the particle depends on the angular speed (ω0) of the frame and not on the angular speed (ω) of the particle. Thus, the value of centrifugal force on the particle is mω02a. It is given that the turntable is rotating with uniform angular velocity. Let the velocity be ω. (d) mg is not less than mv2r. At the top of the path, the direction of mg is vertically downward and for centrifugal force mv2r, the direction is vertically upward. If the vertically downward force is not greater, water will not fall. Consider the circular motion of the earth around the sun. Which of the following statements is more appropriate? (a) Gravitational attraction of the sun on the earth is equal to the centripetal force. (b) Gravitational attraction of the sun on the earth is the centripetal force. (a) Gravitational attraction of the Sun on the Earth is equal to the centripetal force. This statement is more appropriate. Gravitational attraction of the Sun on the Earth provides the necessary centripetal force required for the circular motion of the Earth around the Sun. A car driver going at some speed v suddenly finds a wide wall at a distance r. Should he apply brakes or turn the car in a circle of radius r to avoid hitting the wall? As the wall is at a distance r, the driver should either take a circular turn of radius r or apply brakes to avoid hitting the wall. 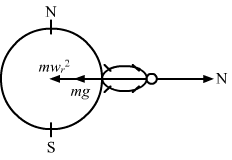 A heavy mass m is hanging from a string in equilibrium without breaking it. When this same mass is set into oscillation, the string breaks. Explain. When the same mass is set into oscillation, the tension in the string increases because of the additional centripetal force of the mass oscillating in a curved path. (d) its velocity and acceleration both change. In a circular motion, the direction of particle changes. Therefore, velocity, being a vector quantity, also changes. As the velocity changes, acceleration also changes. The stone will move in a circle and the direction of velocity at any instant is always along the tangent at that point. Therefore, the stone will move along the tangent to the circle at a point where the string breaks. Let the force of friction between the coin and the rotating turntable be F.
Here, mω2r is the centrifugal force acting on the coin. As the motorcycle is ascending on the overbridge, θ decreases (from π2 to 0). So, normal force increases with decrease in θ. Three identical cars A, B and C are moving at the same speed on three bridges. The car A goes on a place bridge, B on a bridge convex upward and C goes on a bridge concave upward. Let FA, FB and FC be the normal forces exerted by the car on the bridges when they are at the middle of bridges. (a) FA is maximum of the three forces. (b) FB is maximum of the three forces. (c) FC is maximum of the three forces. (d) FA = FB = FC. A train A runs from east to west and another train B of the same mass runs from west to east at the same speed along the equator. A presses the track with a force F1 and B presses the track with a force F2. (d) the information is insufficient to find the relation between F1 and F2. When the trains are moving, effective angular velocity of both the trains are different (as shown in the figure). Effective angular velocity of train B is more than that of train A. From the above equation, we can conclude that F1 > F2. (d) increase at some places and remain the same at some other places. If the Earth stops rotating on its axis, there will be an increase in the value of acceleration due to gravity at the equator. At the same time, there will be no change in the value of g at the poles. A rod of length L is pivoted at one end and is rotated with a uniform angular velocity in a horizontal plane. Let T1 and T2 be the tensions at the points L/4 and 3L/4 away from the pivoted ends. 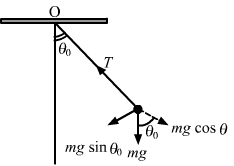 (d) The relation between T1 and T2 depends on whether the rod rotates clockwise or anticlockwise. Let the angular velocity of the rod be ω. When the car is in air, the acceleration of bob and car is same. Hence, the tension in the string will be zero. (d) at the mean position. That is, at the extreme positions, the tension is the string is mgcosθ. When an object follows a curved path, its direction changes continuously. So, the scalar quantities like speed and magnitude of acceleration may remain constant during the motion. (a) The average velocity of the earth from 1st jan, 90 to 30th June, 90 is zero. (b) The average acceleration during the above period is 60 km/s2. (c) The average speed from 1st Jan, 90 to 31st Dec, 90 is zero. (d) The instantaneous acceleration of the earth points towards the sun. The speed is constant; therefore, there is no tangential acceleration and the direction of radial acceleration is towards the Sun. So, the instantaneous acceleration of the Earth points towards the Sun. (d) tangential acceleration remains constant. If the speed is constant, the position vector of the particle sweeps out equal area in equal time in circular motion. Also, for constant speed, tangential acceleration is zero, i.e., constant. A particle is going in a spiral path as shown in figure with constant speed. (a) The velocity of the particle is constant. (b) The acceleration of the particle is constant. (c) The magnitude of acceleration is constant. (d) The magnitude of acceleration is decreasing continuously. As the pitch and radius of the path is constant, it shows that the magnitude of tangential and radial acceleration is also constant. Hence, the magnitude of total acceleration is constant. If the horizontal force needed for the turn in the previous problem is to be supplied by the normal force by the road, what should be the proper angle of banking? A park has a radius of 10 m. If a vehicle goes round it at an average speed of 18 km/hr, what should be the proper angle of banking? Let the angle of banking be θ. If the road of the previous problem is horizontal (no banking), what should be the minimum friction coefficient so that scooter going at 18 km/hr does not skid? 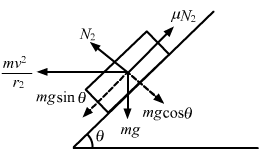 Here, fs is the force of friction and N is the normal reaction. Find the acceleration of the moon with respect to the earth from the following data : Distance between the earth and the moon = 3.85 × 105 km and the time taken by the moon to complete one revolution around the earth = 27.3 days. Find the acceleration of a particle placed on the surface of the earth at the equator due to earth's rotation. The diameter of earth = 12800 km and it takes 24 hours for the earth to complete one revolution about its axis. 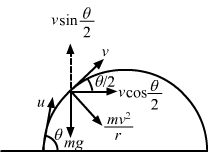 A particle moves in a circle of radius 1.0 cm at a speed given by v = 2.0 t where v is cm/s and t in seconds. (a) Find the radial acceleration of the particle at t = 1 s.
(b) Find the tangential acceleration at t = 1 s.
(c) Find the magnitude of the acceleration at t = 1 s.
A scooter weighing 150 kg together with its rider moving at 36 km/hr is to take a turn of a radius 30 m. What horizontal force on the scooter is needed to make the turn possible? A circular road of radius 50 m has the angle of banking equal to 30°. At what speed should a vehicle go on this road so that the friction is not used? Assume that the vehicle travels on this road at speed v so that the friction is not used. In the Bohr model of hydrogen atom, the electron is treated as a particle going in a circle with the centre at the proton. The proton itself is assumed to be fixed in an inertial frame. The centripetal force is provided by the Coulomb attraction. In the ground state, the electron goes round the proton in a circle of radius 5.3 × 10−11 m. Find the speed of the electron in the ground state. Mass of the electron = 9.1 × 10−31 kg and charge of the electron = 1.6 × 10−19 C.
A stone is fastened to one end of a string and is whirled in a vertical circle of radius R. Find the minimum speed the stone can have at the highest point of the circle. Let m be the mass of the stone. Let v be the velocity of the stone at the highest point. A ceiling fan has a diameter (of the circle through the outer edges of the three blades) of 120 cm and rpm 1500 at full speed. Consider a particle of mass 1 g sticking at the outer end of a blade. How much force does it experience when the fan runs at full speed? Who exerts this force on the particle? How much force does the particle exert on the blade along its surface? The moving fan exerts this force on the particle. The particle also exerts a force of 14.8 N on the blade along its surface. A mosquito is sitting on an L.P. record disc rotating on a turn table at 3313 revolutions per minute. The distance of the mosquito from the centre of the turn table is 10 cm. Show that the friction coefficient between the record and the mosquito is greater than π2/81. A simple pendulum is suspended from the ceiling of a car taking a turn of radius 10 m at a speed of 36 km/h. Find the angle made by he string of the pendulum with the vertical if this angle does not change during the turn. Let T be the tension in the string when the pendulum makes an angle θ with the vertical. The bob of a simple pendulum of length 1 m has mass 100 g and a speed of 1.4 m/s at the lowest point in its path. Find the tension in the string at this instant. Let T be the tension in the string. Suppose the bob of the previous problem has a speed of 1.4 m/s when the string makes an angle of 0.20 radian with the vertical. Find the tension at this instant. You can use cos θ ≈ 1 − θ2/2 and SINθ ≈ θ for small θ. Let T be the tension in the string when it makes an angle of 0.20 radian with the vertical. 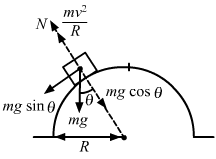 Suppose the amplitude of a simple pendulum having a bob of mass m is θ0. Find the tension in the string when the bob is at its extreme position. Let T be the tension in the string at the extreme position. Velocity of the pendulum is zero at the extreme position. So, there is no centripetal force on the bob. A person stands on a spring balance at the equator. (a) By what friction is the dinbalance reag less than hits true weight? (b) If the speed of earth's rotation is increased by such an amount that the balance reading is half the true weight, what will be the length of the day in this case? (a) Balance reading = Normal force on the balance by the Earth. A turn of radius 20 m is banked for the vehicles going at a speed of 36 km/h. If the coefficient of static friction between the road and the tyre is 0.4, what are the possible speeds of a vehicle so that it neither slips down nor skids up? When the car travels at the maximum speed, it slips upward and μN1 acts downward. Thus, the possible speeds are between 14.7 km/hr and 54 km/hr so that the car neither slips down nor skids up. A motorcycle has to move with a constant speed on an over bridge which is in the form of a circular arc of radius R and has a total length L. Suppose the motorcycle starts from the highest point. (a) What can its maximum velocity be for which the contact with the road is not broken at the highest point? (b) If the motorcycle goes at speed 1/√2 times the maximum found in part (a), where will it lose the contact with the road? (c) What maximum uniform speed can it maintain on the bridge if it does not lose contact anywhere on the bridge? Let m be the mass of the motorcycle and v be the required velocity. Suppose it loses contact at B. So, it will lose contact at a distance πR3 from the highest point. A car goes on a horizontal circular road of radius R, the speed increasing at a constant rate dvdt=a. The friction coefficient between the road and the tyre is μ. Find the speed at which the car will skid. Let v be the speed of the car. Since the motion is non-uniform, the acceleration has both radial (ar) and tangential (at) components. A block of mass m is kept on a horizontal ruler. The friction coefficient between the ruler and the block is μ. The ruler is fixed at one end and the block is at a distance L from the fixed end. The ruler is rotated about the fixed end in the horizontal plane through the fixed end. (a) What can the maximum angular speed be for which the block does not slip? (b) If the angular speed of the ruler is uniformly increased from zero at an angular acceleration α, at what angular speed will the block slip? (b) Let the block slip at an angular speed ω2. A track consists of two circular parts ABC and CDE of equal radius 100 m and joined smoothly as shown in figure. Each part subtends a right angle at its centre. A cycle weighing 100 kg together with the rider travels at a constant speed of 18 km/h on the track. (a) Find the normal contact force by the road on the cycle when it is at B and at D. (b) Find the force of friction exerted by the track on the tyres when the cycle is at B, C and. (c) Find the normal force between the road and the cycle just before and just after the cycle crosses C. (d) What should be the minimum friction coefficient between the road and the tyre, which will ensure that the cyclist can move with constant speed? Tendency of the cycle to slide is zero. So, at B and D, frictional force is zero. (d) To find the minimum coefficient of friction, we have to consider a point where N is minimum or a point just before c .
In a children's park a heavy rod is pivoted at the centre and is made to rotate about the pivot so that the rod always remains horizontal. Two kids hold the rod near the ends and thus rotate with the rod. Let the mass of each kid be 15 kg, the distance between the points of the rod where the two kids hold it be 3.0 m and suppose that the rod rotates at the rate of 20 revolutions per minute. Find the force of friction exerted by the rod on one of the kids. Thus, the force of frictional on one of the kids is 10π2. A hemispherical bowl of radius R is rotated about its axis of symmetry which is kept vertical. A small block is kept in the bowl at a position where the radius makes an angle θ with the vertical. The block rotates with the bowl without any slipping. The friction coefficient between the block and the bowl surface is μ. Find the range of the angular speed for which the block will not slip. When the bowl rotates at maximum angular speed, the block tends to slip upwards. Also, the frictional force acts downward. Let N1 be the normal reaction on the block and ω1 be the angular velocity after which the block will slip. 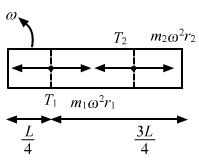 Hence, the range of speed is between ω2 and ω1. A particle is projected with a speed u at an angle θ with the horizontal. Consider a small part of its path near the highest position and take it approximately to be a circular arc. What is the radius of this circular circle? This radius is called the radius of curvature of the curve at the point. Here, r is the radius of curvature of the curve at the point. What is the radius of curvature of the parabola traced out by the projectile in the previous problem at a point where the particle velocity makes an angle θ/2 with the horizontal? Let u be the initial velocity and v be the velocity at the point where it makes an angle θ2with the horizontal component. It is given that the horizontal component remains unchanged. A block of mass m moves on a horizontal circle against the wall of a cylindrical room of radius R. The floor of the room on which the block moves is smooth but the friction coefficient between the wall and the block is μ. The block is given an initial speed v0. 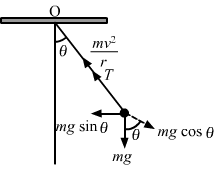 As a function of the speed v write (a) the normal force by the wall on the block, (b) the frictional force by wall and (c) the tangential acceleration of the block. (d) Integrate the tangential acceleration dvdt=vdvds to obtain the speed of the block after one revolution. (c) Let at be the tangential acceleration of the block. A table with smooth horizontal surface is fixed in a cabin that rotates with a uniform angular velocity ω in a circular path of radius R. A smooth groove AB of length L(<<R) is made the surface of the table. The groove makes an angle θ with the radius OA of the circle in which the cabin rotates. A small particle is kept at the point A in the groove and is released to move at the point A in the groove and is released to move along AB. Find the time taken by the particle to reach the point B. 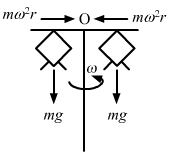 Let the mass of the particle be m.
The component of force mRω2 along the line AB (making an angle with the radius) provides the necessary force to the particle to move along AB. Let the time taken by the particle to reach the point B be t.
A car moving at a speed of 36 km/hr is taking a turn on a circular road of radius 50 m. A small wooden plate is kept on the seat with its plane perpendicular to the radius of the circular road. A small block of mass 100 g is kept on the seat which rests against the plate. the friction coefficient between the block and the plate is . (a) Find the normal contact force exerted by the plate on the block. (b) The plate is slowly turned so that the angle between the normal to the plate and the radius of the road slowly increases. Find the angle at which the block will just start sliding on the plate. (a) Let us find the normal contact force (N) exerted by the plant of the block. (b) The plate is turned; so, the angle between the normal to the plate and the radius of the rod slowly increases. A table with smooth horizontal surface is placed in a circle of a large radius R. A smooth pulley of small radius is fastened to the table. Two masses m and 2m placed on the table are connected through a string going over the pulley. Initially the masses are held by a person with the string along the outward radius and then the system is released from rest (with respect to the cabin). Find the magnitude of the initial acceleration of the masses as seen from the cabin and the tension in the string. Let the bigger mass accelerates towards left with acceleration a. Let T be the tension in the string and ω be the angular velocity of the table.